表1｜気管支肺胞洗浄液（BALF)細胞診の正常所見。猫では好酸球数が多い（日本小動物内視鏡推進連絡会呼吸器内視鏡分科会. 呼吸器内視鏡ガイドライン p27 表３より転載）。文献１：Hawkins EC. Bronchoalveolar Lavage In: King LG, ed. Textbook of Respiratory Diseases in Dogs and Cats. St.Louis: Saunders, 2004;118-128. 1.日本小動物内視鏡推進連絡会呼吸器内視鏡分科会. 呼吸器内視鏡ガイドライン. 東京: 日本小動物内視鏡推進連絡会事務局, 2011. 2.桝田幹郎, 鈴木隆, 鈴木秀一, et al. 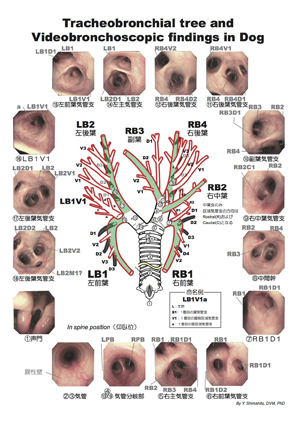 小児気道異物の摘出におけるラリンゲルマスク(Laryngeal mask)の有用性. 気管支学 2004;26:83-87. 3.Amis TC, McKiernan BC. 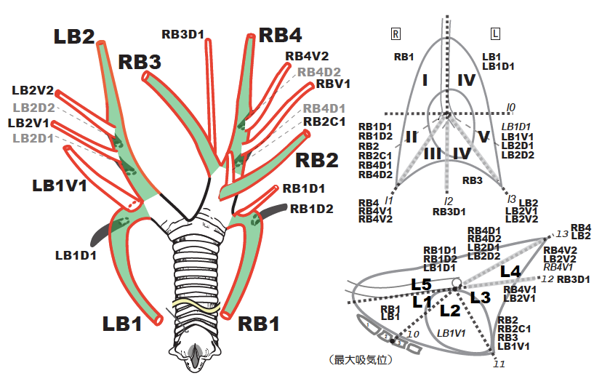 Systematic identification of endobronchial anatomy during bronchoscopy in the dog. Am J Vet Res 1986;47:2649-2657. 4.城下幸仁, 松田岳人, 佐藤陽子, et al. 犬猫における気管支鏡検査　適応および解剖学的考察. 動物臨床医学会年次大会プロシーディング 2006;27回:200-201. 5.城下幸仁, 松田岳人. 胸部レントゲン像における犬の葉・区域気管支の分布と走行. 第25回動物臨床医学会年次大会プロシーディング 2004;No.3, 146-147. 6.城下幸仁, 松田岳人, 佐藤陽子, et al. 粘液栓によって胸部X線に限局性肺胞浸潤影のみられた猫の１例. 第26回動物臨床医学会年次大会プロシーディング 2005;No.2, 29-30. 7.Hawkins EC, DeNicola DB, Kuehn NF. Bronchoalveolar lavage in the evaluation of pulmonary disease in the dog and cat. State of the art. J Vet Intern Med 1990;4:267-274. 8.Hawkins EC. 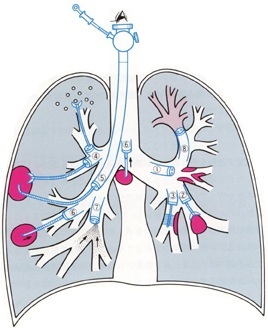 Bronchoalveolar Lavage In: King LG, ed. Textbook of Respiratory Diseases in Dogs and Cats. St.Louis: Saunders, 2004;118-128. 9.田村昌士. 気管支肺胞洗浄[BAL]法の臨床ガイドライン. 東京: 克誠堂, 1999. 10.城下幸仁. 呼吸困難をともなった猫の下気道感染症の2例. 第5回日本臨床獣医学フォーラム年次大会2003 2003;Vol.5-1, 5-72~73. 11.Tenwolde AC, Johnson LR, Hunt GB, et al. 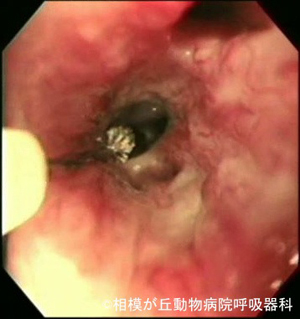 The role of bronchoscopy in foreign body removal in dogs and cats: 37 cases (2000-2008). J Vet Intern Med 2010;24:1063-1068. 12.Martinot A, Marquette CH, Ramon P, et al. Foreign body aspiration in childhood: management algorithm. Eur J Emerg Med 2000;7:77-78. 13.米澤覚, 太田亮, 矢島信一, et al. 胸部気管切開により摘出した猫の気管内異物. 動物臨床医学会年次大会プロシーディング24回２号 2006:129-130. 14.Padrid PA, McKiernan BC. 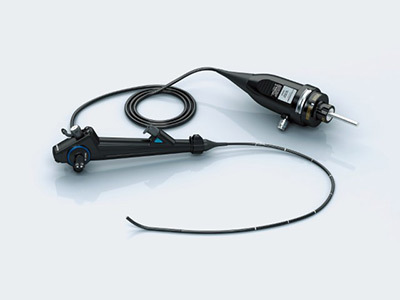 Tracheobronchoscopy of the Dog and Cat In: Tams TR, ed. Small Animal Endoscopy. 2nd ed. St.Louis: Mosby, 1999;377-396. 15.Goodnight ME, Scansen BA, Kidder AC, et al. Use of a unique method for removal of a foreign body from the trachea of a cat. J Am Vet Med Assoc 2010;237:689-694. 16.Tivers MS, Moore AH. 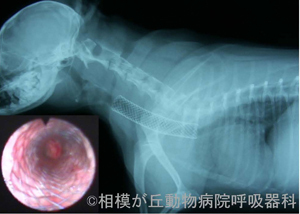 Tracheal foreign bodies in the cat and the use of fluoroscopy for removal: 12 cases. J Small Anim Pract 2006;47:155-159. 17.Zambelli AB. 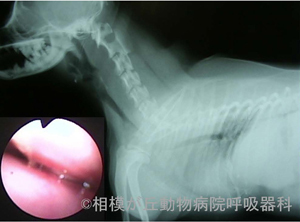 Pneumomediastinum, pneumothorax and pneumoretroperitoneum following endoscopic retrieval of a tracheal foreign body from a cat. J S Afr Vet Assoc 2006;77:45-50. 19.佐藤洋子, 関根和彦, 安倍晋也, et al. 自作透明フードを装着した気管支鏡により摘出できた気道異物の1例. 日本救急医学会雑誌 2009;20:929-934. 20.Bolliger CT, Mathur PN. Interventional Bronchoscopy. Basel: Karger, 2000. 21.Stedja G, Bolliger CT. Endbronchial Electrocautery and Argon Plasma Coagulation In: Bolliger CT,Mathur PN, eds. Interventional Bronchoscopy Prog Respir Res. Bases: Karger, 2000;120-132. 23.Colt HG, Crawford SW. In vitro study of the safety limits of bronchoscopic argon plasma coagulation in the presence of airway stents. Respirology 2006;11:643-647. 24.佐藤雅美, 近藤丘. 内視鏡下治療の適応と安全性-高出力レーザー治療を安全に施行するために. 日本気管支学会　第13回気管支鏡セミナー　気管支鏡検査-基本、安全性とその進歩. 千葉: 第24回日本気管支学会, 2001;67-79. 25.日本気管支学会. 気管支鏡　臨床医のためのテクニックと画像診断. 東京: 医学書院, 1998. 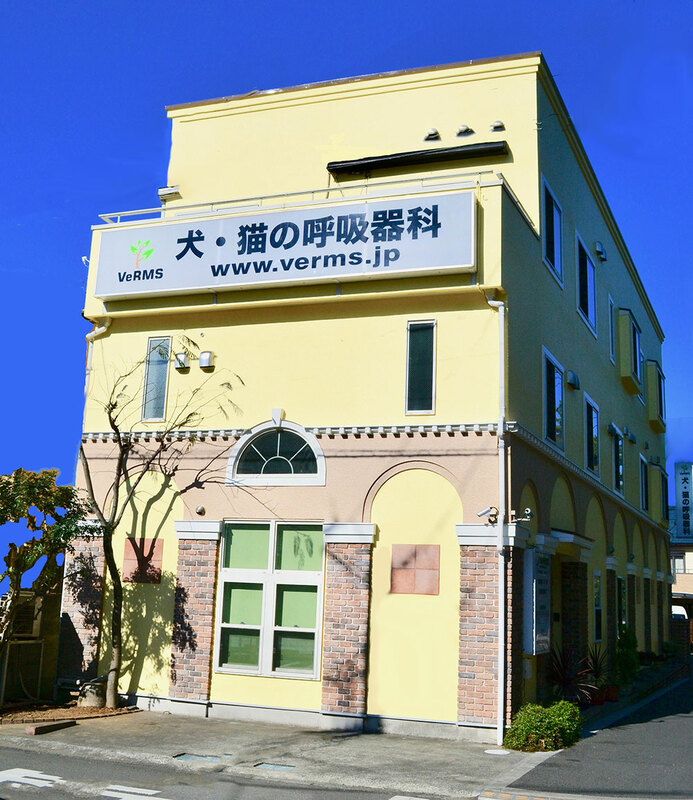 26.Fujisawa T, Hongo H, Yamaguchi Y, et al. 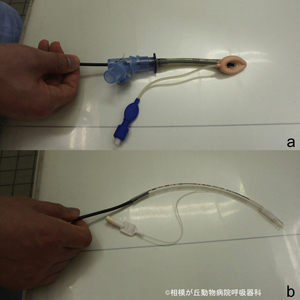 Intratumoral ethanol injection for malignant tracheobronchial lesions: a new bronchofiberscopic procedure. Endoscopy 1986;18:188-191. 27.城下幸仁, 松田岳人, 柳田洋介, et al. 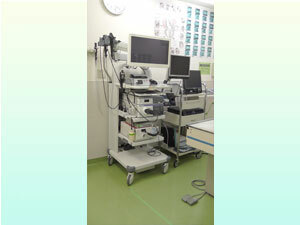 気管分岐部を閉塞する中枢気道内腫瘍に対しinterventional bronchoscopyにて管理した猫の1例. 動物臨床医学会年次大会プロシーディング 2008;29回:135-136. 28.根岸宏行, 西根広樹, 石川文月, et al. 気道ステントをめぐる諸問題　pros and cons 肉芽増生による気道狭窄に対するマイトマイシンC局所塗布治療. 気管支学 2007;29:14-19. 29.城下幸仁. 気管虚脱の積極的治療法について　外科的治療法VS気管内ステント留置法 気道内ステント留置法. 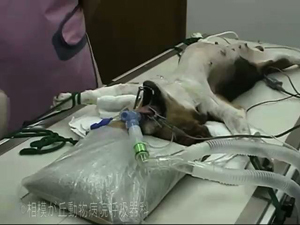 動物臨床医学会年次大会プロシーディング 2009;30回:303-307. 30.城下幸仁. 気管虚脱の診断と治療 ステント. 獣医麻酔外科学雑誌(0916-5908) 2012;43:80-81. 32.Moritz A, Schneider M, Bauer N. Management of advanced tracheal collapse in dogs using intraluminal self-expanding biliary wallstents. J Vet Intern Med 2004;18:31-42. 33.岩田和也, 千村収一. 気管内ステント(Ultraflex)を留置した重度気管虚脱の犬の1例. 獣医畜産新報 2007;60:216-220. 34.城下幸仁, 松田岳人, 佐藤洋子, et al. 犬の気管虚脱GradeIVに自己拡張型金属ステントEasy WallstentTMの気管内留置を試みた1例. 第9回日本臨床獣医学フォーラム年次大会2007 2007;vol.9-1, 6-18~19. 35.Kim JY, Han HJ, Yun HY, et al. 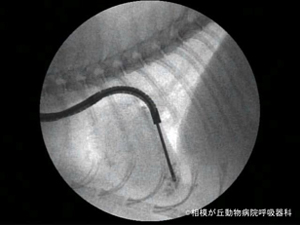 The safety and efficacy of a new self-expandable intratracheal nitinol stent for the tracheal collapse in dogs. J Vet Sci 2008;9:91-93. 36.Kim JH, Shin JH, Song HY, et al. 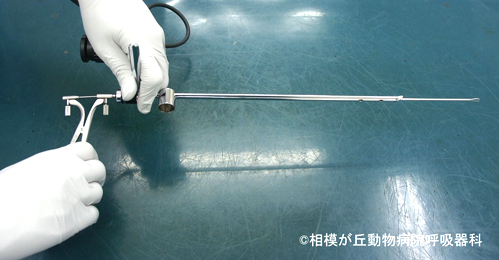 Use of a retrievable metallic stent internally coated with silicone to treat airway obstruction. J Vasc Interv Radiol 2008;19:1208-1214. 37.Sun F, Uson J, Ezquerra J, et al. 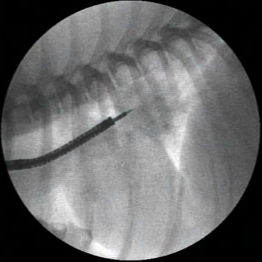 Endotracheal stenting therapy in dogs with tracheal collapse. Vet J 2008;175:186-193. 38.Sura PA, Krahwinkel DJ. 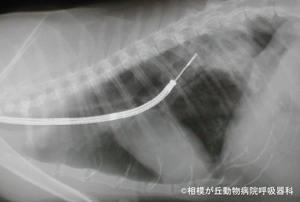 Self-expanding nitinol stents for the treatment of tracheal collapse in dogs: 12 cases (2001-2004). J Am Vet Med Assoc 2008;232:228-236.